Bobby "Be careful with Godfrey. He would do anything to save his a$$. Just keep an eye out"
9:30am Big Brother wakes up the house guests. They start getting ready for the day. Bobby talks to Bruno. Bobby says what a crap shoot the next couple weeks will be. Bruno says yeah buddy. 100%. Bobby says no one trusts no one. It doesn’t even matter if you found out about lies a couple week ago.. everyone lied to everyone. Bruno says I don’t trust no one. Bobby tells Bruno that Zach and I had a more real talk last night in the pantry. Bruno asks do you think we (Godfrey & Bruno) are all right? Bobby says I think they’re turning it on to Sarah. That was definitely something I was trying to push for. Bruno says tell Bobby if you talk to him tell him I’m good. Bobby says I think he wants to work with you. Bruno says right now all I have is Godfrey. Its me and him. Bobby says still be careful with Godfrey though. He actually did throw my name under the bus when he was on the block. JP told him that he wanted to backdoor me .. so JP told God to tell Zach to throw me up there. He knew JP and Zach were working super close together at that time. He would do anything to save his a$$. Just keep an eye out. Burno says yeah I know there is a time when he will sell me out but I don’t have anyone else right now. 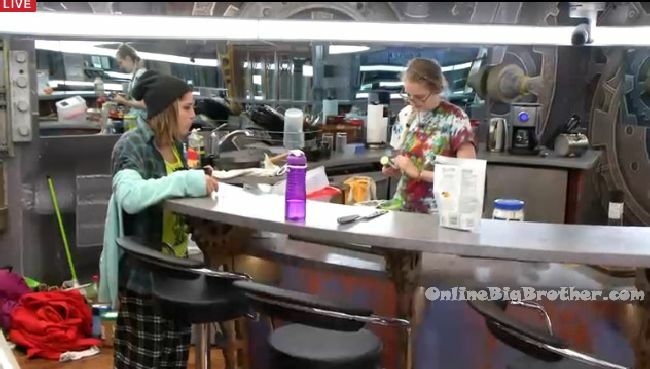 10am In the kitchen – Sarah Brittnee and Willow are talking. Sarah tells Brittnee you should say if you think putting a pawn up is going to keep people from coming after you .. you’ve got another thing coming! Big Brother tells the house guests to report to the head of household room. Everyone heads into the HOH room. Big Brother immediately starts telling them nap time is over. 10am Big Brother blocks the feeds. 2:30pm The feeds are still blocked and will be for the rest of the day for the Live Triple Eviction Episode airing tonight. That’s my ideal, Zach and Pilar following Bobby tonight. I really want Willow to win this HOH. I know a number of people don’t like her but she is coasting right now and flying under everyone’s radar. If she wins she is forced to show her cards and exposes herself to being voted out, which is ultimately what I want to happen! She would do what Sarah wants.If the target is Bruno, Willow will be OK.If she turns on Diapers, she will be in deep trouble. The countdown is on! Whirlwind approaching! Oh Bobby, you’re on your way out and you just give one stupid advice to your boy Bruno. Like putting a wedge between God and him is the best for his game now. News flash bobby, for someone who eliminated a potential ally in a game for an HOH, invented a fake veto to put a target on your back and tries to rally an all guys alliance to save yourself when majority of the voting houseguests are girls, you are terrible at this game and does not deserve to give any advice. Well Godfrey already revealed that info to Bruno. And he described it in a believable manner. Bobby is pretty terrible at this game. Glad to see him go. anybody else get the feeling the hoh comp tonight might be another of those lame knock out style trivia comps? one of the ones where they ‘randomly’ select the first two players? not enough time for endurance, unless they start it by noon. takes up too much room in the yard to set up two physical comps in one day, so either the hoh or the pov have to be trivia imo. I fully expect production to f*** this triple eviction up for us fans. I am kinda thinking the same thing unfortunately. If anyone f’s. this up.. it will be Global for sure…when I heard last year it was moving from Slice…I knew that was going to not be a good thing. They should have made the show 90 minutes tonite too! Was listening to RHAP’s podcast with Derrick yesterday and Rob said that he will not have an exit interview with the first person evicted (Brittnee/Bobby) but he will have an exit interview with the two victims of the Triple eviction uploaded by Thursday/Friday. So, I believe we will see 3 people getting evicted today. Ahh great to know thanks! How can Rob being having interviews with people going to jury? Or do you mean Arisa won’t be having an exit interview with the evictees? I wonder if the two people getting evicted at the same time will NOT be going to jury…it would solve the huge jury problem…. Rob also interviewed Sindy last week, so I don’t think interviewing them means they’re not going to jury. As the hamsters leave they do a series of press interviews and once they hit jury there are specific things the journalists cannot discuss with them i.e. they can’t tell them what is happening in the house. Pretty sure Entertainment Tonight Canada interviews them all and Rob is one of those type of interviews. It’s more questions like: Who did you trust, what decision would you change, why were you voted out type of questions. simon I totally agree with you ! I’m not overly excited for tonight’s show because I have a strong feeling production will make it zach and Kevin friendly so those tools will stay in the house! Um, have you watched live double evictions before? This show will not have a script, it will be quick competitions. SUNDAY will be the scripted flash back DR’s. Then a possible jury house visit with all 3 new peeps probably Monday. Funny that Kevin and Sarah have a hundred more DR’s than Pili, Ashley and Willow. Britney has quite a lot considering how little impact she has in the house. I think they like her perspective. They are trying to look “fair” by including her, I think. As a player, she hasn’t added much else. I’m probably in the minority, but I’m not very concerned about who’s leaving. There are enough people playing hard (Sarah, Kevin, Bruno, Godfrey, and to a lesser extent; Willow, Ashleigh, and Zach) to keep the game interesting no matter who goes. It will be interesting to see who feels comfortable tonight in the HOH Comp. Several have expressed possibly throwing it. As of now I expect Pili will put the most effort into winning. Bruno is going to stroke out when he finds out 2 more people are leaving tonight, can’t wait to see his face. I’m a Kevin fan so I’m hoping Zach or one of the two floaters win….if anybody else wins HOH Kevin & Zach can kiss their dreams of $100K goodbye, the only way they survive is winning the POV…..if by a miracle Bruno wins HOH, Sarah/Kevin/Ash are on the block…..
I’d love to see Zach win hoh and get out Brittney and Sarah. Production won’t let that happen cuz they would have to put Sarah on suicide watch…she will be crying until the finale lol. If Sarah/Kevin go out tonight production would have to be on suicide watch. Lol @ Simon, ‘if’ that happens… screw the watch part. I’d like to see Sarah winning HOH to see who she will put up. Bruno&Godfrey maybe? I hope tonight will be good and not just another wasted opportunity. Hopefully Bobby goes first. Would really love to see Zach gone, as for the other person I could really care less as long as its not Kevin, Sarah, or Godfrey. Don’t see anyone playing hard for jury votes. Don’t see anyone playing hard for jury votes. Just a few backstabbers. Haven’t watch enough feeds, but God in the show has been seen playing up jury votes. Could be a global edit but meh I don’t think anyone deserves to win this year except the seagull. I just noticed that Big Brother After Dark is not on tonight or any night for the next week. That’s so bizarre. When I looked awhile ago, it was not showing but now it is. Weird!! So, have we figured out who would put who up tonight if they win HOH? Has Brit. even been campaigning ? If Zach and Pilar are evicted..game on. We will finally get a big brother to watch. Not going to be able to watch tonight`s episode. When do you guys usually hear the spoiler results so I can check in and see who won the HOH and who got evicted? We usually find out the spoilers about an hour to an hour and a half before the episode airs. Wednesday’s episode airs at 9pm eastern time … so if there are spoilers we will likely know by about 8pm eastern time. You find out before the episodes air? How? I thought the show aired live, especially eviction shows? I’m not interesting in names or sources, but just in general how you get your spoilers before the shows air. The show is filmed in font of live audience but is taped and airs after. I believe they open the doors at 2:30 EST so they’re probably done taping by now. The spoilers come from people in the audience. 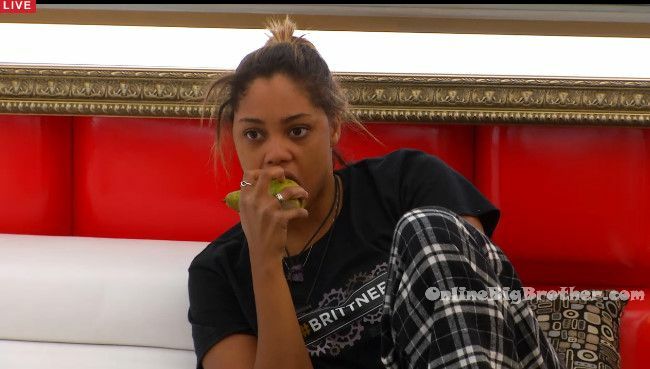 The source I trust is hamsterwatch her BBCAN show spoilers have been right 100% of the time going back as far as season 1. Thanks Simon. I don’t know who hamsterwatch is myself because I enjoy and rely only on OBB. It’s all I need. You have the best and thorough updates, complete with videos if there’s an aspect of them that I would like to see play out. Also, it’s a place to openly talk about BB with other fans and we don’t have to worry about talking about spoilers and “ruining” an episode for others who haven’t watched it yet. In short. This site has everything anyone could possibly want. Usually I HATE spoilers for anything. But, I like them for BB because I want to know who the house guests REALLY are, not the heavily edited version of them and who they want us to THINK they are based on their (rarely accurate) introduction videos. I quit watching Live Feeds because they were boring and exhausting at the same time. But, even reading the posts here is exhausting. These people say the same things over and over and over again… ad nauseum. Why do they even bother talking to each other? None of them believes the other when they do talk, so what good does it do them? It doesn’t keep them closer either. These people might actually enjoy the experience more if they just went about their day and took a page from Bobby’s book and only talked game on Tuesdays. I’m at the point where I don’t care who wins anymore. I can’t stand any of them. My dream, though, would be to see Ashleigh blindside Zach and take him out. He deserves to go out in the worst possible way. He’s not smart. He can’t read people correctly. He’s too cocky and, like in real life, relies on his looks to get what he wants because it’s all he has going for him). I’m ready for this season to end. I wish tonight’s episode was a massive Flash Forward and the rest of the season played out at once. I so hope you aren’t joking! I heard that Kevin and Willow are evicted, Pillar was saved by the votes. Everyone voted who to ‘save’. WTF, Brittnee was always anti Ash but renoms Willow and not Ashley… 3 people evicted but both Zach and Ash are still in the game… Brittnee is an idiot!!!! Congrats B, you just totally screwed Sarah’s game. Remove one player from each side of the house and let Bruno walk right in to Kevin’s spot… hey does that make God the new Pilar?